The delay is due to additionally timed needed to repair the carrier’s nuclear propulsion system and weapons elevators. The USS Gerald R. Ford’s (CVN-78) first operational deployment has been pushed back by at least three months, U.S. Navy officials told members of the U.S. House of Representatives on March 26. 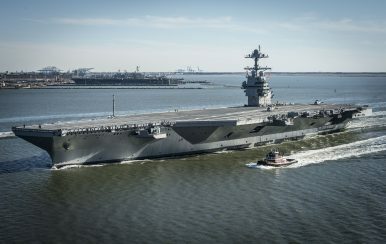 The USS Gerald R. Ford is currently undergoing its post-shakedown availability (PSA) period at Newport News Shipbuilding in Newport News, Virginia. PSA, which addresses technical deficiencies found after the successful completion of sea trials. PSA began in July 2018 and was originally set to be completed in July 2019. PSA is now expected to be completed in October at the earliest due to additionally timed needed to repair the carrier’s nuclear propulsion system and advanced weapons elevators. “We had that scheduled as a 12-month availability, where we were going to both complete some nuclear propulsion work on the plant, do some more of the ShipAlts [ship alterations] and then finish up the elevators,” James F. Geurts, the U.S. Navy’s Assistant Secretary for Research Development and Acquisition, told the House Seapower and Projection Forces Subcommittee. According to USNI News, the problems with the propulsion system are related to the carrier’s main turbines generators that are driven by the steam that the Ford’s nuclear reactors produce. Earlier this month, the Ford accepted its second advanced weapons elevator (AWE). Weapons elevators carry ammunition quickly to the carrier’s flight deck to be loaded onto fighter jets. It is a crucial component in guaranteeing fast aircraft sortie rates. The Ford was designed to increase the aircraft sortie generation rate by 25 to 30 percent over the previous Nimitz-class of nuclear aircraft carriers. As other new technologies and subsystems installed aboard the Ford, the AWE was plagued by a host of technical problems. According to a June 2017 Government Accountability Office report, the AWEs “continue to have issues with reliability, which will affect their ability to support aircraft operations.” Notably, Secretary of the Navy Richard V. Spencer promised U.S. President Trump that all 11 AWE would be working by the end of PSA, scheduled to occur in July, otherwise he would resign. In February, Raytheon and the Navy conducted the first-ever live fire test of the Ford’s so-called Ship Self Defense System (SSDS) Integrated Combat System on the service’s Self Defense Ship. The USS Gerald R. Ford is the most expensive warship in U.S. Navy history, with total procurement cost amounting to approximately $13 billion. Weapons elevators are an important component in guaranteeing faster aircraft sortie rates from the new supercarrier.